Cats don't understand the idea of "owner" but they have excellent memories. Assuming you've had a range of interactions with your cat, he'll probably remember you years from now. Cats have an excellent memory that anchors heightened states of mind with sensory perceptions. Though your cat probably doesn't understand human conceptions of ownership, he probably remembers that time you fed him fresh salmon. Cats are like the proverbial elephants of memory: They never forget. "Once attained, even by accident or trial and error, most knowledge is retained for life, thanks to the cat's excellent memory," notes an article on the TV channel Animal Planet's website. Feline intelligence remains under scientific study -- the once widely held belief that kittens observe and imitate their mothers and other cats has been challenged -- but their excellent memory appears to be a foundation stone. 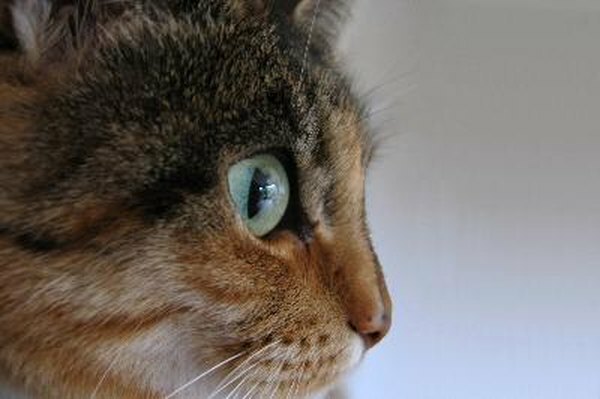 Cat memories are tied to their most attenuated senses -- sight, smell and sound. The more unique combination of these things you embody, the more distinct your impression on your cat. A cat's memories of excited states, both good and bad, appear to be his most vibrant and enduring. "All it takes is one face-to-face encounter with a growling dog to convince a feline that the entire canine specie is best avoided forever," notes Animal Planet. "However, positive experiences are just as easily stored and recalled, particularly if they have to do with food or play." Some research shows a cat's short-term memory is on par with a 2- or 3-year-old, compared to the 16-hour retention of dogs. Internet blogs and forums are filled with anecdotal evidence attesting to their even more impressive long-term memories. Research and anecdotes asides, the sheer mechanics of memory illustrate it's possible for cats to remember their owners when they're associated with a strong stimulus. If you feed your cat, give him treats and play with him, he'll likely remember you. The more distinct the set of circumstances, the more likely it's ingrained for good. A healthy cat has a good memory, but not all cats stay healthy as they age. More than half of cats 11- to 15-years-old suffer from feline cognitive dysfunction, according to an article from the American Society For the Prevention of Cruelty to Animals. The same is true for 80 percent of cats ages 16-20. This condition has adverse affects on memory retention and recall, and results in overall cognitive decline. Feline cognitive function is not unlike dementia in humans, and may cause your cat not to remember you later today, let alone years from now. CatsPlay.com: How Does your Cat Recognize You? Carey's Cats: Do Cats Know Their Owners?